During the week of January 16-18, EENC sent our ee360 Leadership Team to Monterey, CA. There they met with the other nine Leadership Teams that NAAEE selected last summer to receive EPA funding to help move EE forward in each state. While in California, the EENC team did a mini presentation to update the group on the status of the two goals set in West Virginia during the first meeting, and announced the hiring of our first staff member, Lauren Pyle. Lauren was in attendance at the meeting, along with Partnership Chair Brad Daniel, President Shannon Culpepper, and former board members Renee Strnad and Michelle Pearce. The ee360 meeting was combined with an NAAEE Affiliate Meeting, bringing the total to over 30 states present in the room. During the breakout sessions, EENC was also able to lead a session on our accomplishments with an all-volunteer board. EENC was able to serve as an example of drive and leadership, and is looking forward to continued work with NAAEE and the ee360 teams. 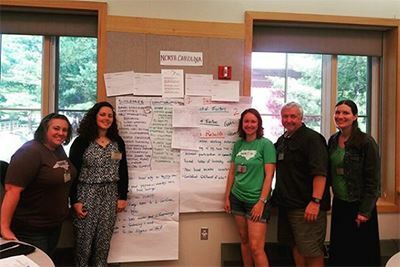 In year two of our funding, EENC will be working on board training in fundraising and best practices in diversity, equity, and inclusion in the work of Environmental Education in our state. We're going to start posting monthly board member spotlights here on the blog! First up, our communications chair, Chris Goforth. Chris' move to North Carolina marked a major shift in her career path. She had always planned to become an entomology professor and was working toward that goal with a BA in Biology and an MS in entomology. She started a citizen science project, somewhat accidentally, during her time as a PhD student and fell in love. Citizen science combined the work she enjoyed most (scientific research, teaching, and science communication) and it became more and more of a focus for her. She eventually applied for her current position as head of citizen science at the North Carolina Museum of Natural Sciences and moved across the country to start a whole new life. 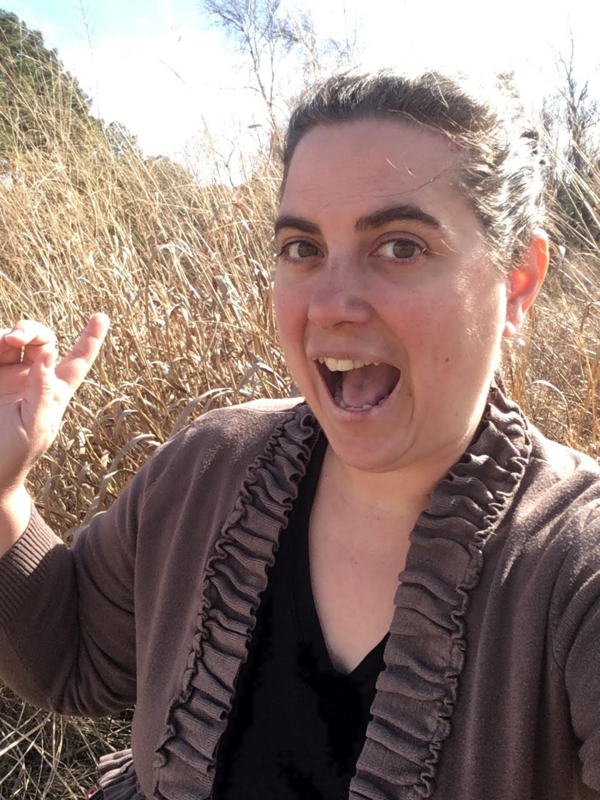 She was especially thrilled with being placed at the Museum's field station, Prairie Ridge Ecostation, because of the great new ability it gave her to work with the public as an environmental educator. Chris likes environmental education because in her ideal world everyone everywhere would be aware of and appreciate the nature all around them. Even the most urban areas have SOME nature (red-tailed hawks are all over New York City after all!) and Chris would love to see people understand just how much life we have on our planet, including our own backyards. She especially loves teaching about insects as they are often the forgotten or reviled part of nature and she loves the fact that her current job allows her to not only teach about insects, but also provide people a concrete way that they can interact with, study, or otherwise learn more about insects through citizen science projects. Chris joined the EENC board as the Central Section Chair in 2016 and then took on the role of Communications Chair last year. She feels strongly that good communication and easy navigation of the resources EENC provides will help build the organization and get people excited about environmental education across North Carolina. Plus, she really loves photography, social media, and building websites, so her current role allows her to support the organization while doing something she enjoys. This year, Chris wants to focus on reviving EENC Echoes, the EENC newsletter, and moving the conference program toward a more sustainable app based format. She's also trying to build the EENC Instagram account, so please send photos and your username (if you have one - you can send photos even if you're not on Instagram) to her via e mail if you'd like to help provide content! She is addicted to flying fox/fruit bat videos. They're her favorite non-insect animals and she watches rescue videos from Australia more often than she cares to admit. She won a writing competition when she was in middle school and got to read her entry on the local PBS station. It aired daily for about a month. She made money in high school by selling cakes she decorated to teachers, friends, and other people. She made multiple wedding cakes, but quit after the cake collapsed on the way to a friends' wedding. She did make her sister's wedding cake though! EENC hires first executive director! Environmental Educators of North Carolina is thrilled to announce the hiring of an Executive Director, Lauren Pyle. A former board member and professional life member of EENC, Lauren has been active in the environmental education community in North Carolina for over eight years. Lauren has worked as part of the education team at the Western North Carolina Nature Center in Asheville, where she wears many hats. She has wrangled teen volunteers, helps the public navigate the online registration system, leads public wildlife demonstrations including feeding otters, and has experience writing grants to fulfill "pie-in-the-sky" programs. Previously, Lauren worked with youth education at The North Carolina Arboretum, has contributed to strategic planning processes with three different organizations, simultaneously taught college freshman biology/8th grade physical science/telemark skiing during her undergraduate and masters programs at Cornell University, and spent five summers catching bats as a wildlife biologist for an environmental consulting company. The Board of Directors have been working towards this goal for many years to help build the capacity of our organization, and Lauren is excited to help advance the mission and vision of EENC. The Executive Director position is currently part-time, with the intent to become full-time through additional grant funding. We are so excited to be taking this step to help our organization be a leader in the field of environmental education within North Carolina, the southeast, and the nation. Please join us in welcoming Lauren. She can be reached via e mail anytime! The Executive Director will serve part-time, approximately 20 hours per week, performing duties assigned by the Board of Directors. The position is for a one-year term, with the opportunity to extend if agreeable to all parties. The employee will work predominately from home. Travel is required. This is a newly created position and the Executive Director will work directly with the EENC Board of Directors to develop a work plan. After the initial contract year, the position may transition into a 40 hours per week position. As the position grows, the Executive Director will be responsible for securing partial funding for additional contract years. Coordinate donor cultivation and management, grant writing, annual appeals, sponsorship solicitations, and other fundraising and development needs of EENC. Work with Resource Development Chair to maintain donor database and manage grants. Serve as one of two EENC representatives to the Southeastern Environmental Educators Alliance (SEEA). Attend statewide and regional meetings to represent EENC’s interests and foster publicity, partnerships, and outreach. Act as liaison with community, state, national, and international organizations to foster publicity, partnerships, and outreach for the organization. Assist Board of Directors with tasks including developing marketing materials, content for website, and social media; work to grow and diversify membership; conference and workshop planning; and assist with setting the agenda for board meetings. Provide monthly activity report to Personnel Committee, including number of hours worked, tasks accomplished, and status of work. Provide monthly financial report and summary of activities to the Treasurer. Provide quarterly report to Board of Directors with summary of activities and status of work. Experience in nonprofit management, board management, public relations, business, marketing, or a natural resource-related field is preferred. Familiarity with environmental education and an understanding of the field in the state, nationally, and internationally. Experience in nonprofit fund development. Experience with website development and maintenance and use of social media for business. Excellent spelling, grammar, typing, and organizational skills. Proficient with Office Suite and Google Suite. Experience with bookkeeping or financial management. Must reside in North Carolina. Must have the ability to work from home (or another location) and be able to travel for meetings, conferences, etc. $23,000 to $28,000. $5,000 stipend provided for benefits. Computer, equipment, and cell phone will also be provided. Submit a cover letter and resume to Shannon Culpepper, EENC President-Elect at eencpreselect@gmail.com by Monday, November 13 at 5:00 pm. Looking for a way to help with hurricane relief efforts in Texas and Florida? We're collecting donations of the items most needed in the hurricane impact zones at the 2017 conference! Consider bringing any of the following items to Agape with you and board member Elissa Riley will deliver them to a relief group in Wilmington, Ten on Ten, after the conference. From there, they'll make their way to the people who need them in Texas and Florida! Now accepting board nominations and student scholarship applications! Both board nominations and student scholarship applications are due September 1, so get yours in soon! Early bird registration ends Monday, 7/17, so plan to get yours in this week for the best price! Full conference registration will go up $20 on starting 7/18. Can't register this week? No problem! We accept registrations through Friday, September 8. It's that time of year again - conference registration time! Register now for early bird deals and join us at Agape for a fun weekend of professional development, informative field trips and workshops, and great networking. We have a new website and membership management service this year, so registration will work a little differently than you may be used to. In years past, you received a membership discount code for the conference. You don't need a code this year! When you register, the system automatically recognizes you as a member if your membership is up to date and you use the same email address that you've used on the EENC website in the past. (You may be prompted for a password if you have not yet logged into the new site!) Then simply choose the membership registration type that applies to you from the options on the registration form. Visit the conference page for more information about the conference and to download a copy of the detailed conference registration packet. The packet provides specifics on registration types, lodging options, and field trip/workshop prices, times, and descriptions. Early bird registration ends July 17th, so make plans to register soon for the best price! If you have any questions about the registration process, please contact Shannon Culpepper, registration co-chair and your EENC president elect. Hope to see you at Agape! Conference proposal season is officially over! The requests for session and research symposium proposals are now closed. Thanks to everyone who submitted a conference proposal for the 2017 conference at Agape! The sessions our members provide are what make our conference great. Look out for an e mail soon with news about whether you proposal was accepted or not! Want to present at the Environmental Educators of North Carolina conference at Agape Center for Environmental Education this September? Get your proposals in soon! Proposals for both regular conference sessions and the research symposium are due Monday, May 15. Add your voice to the conference - hope to see you there!